I am looking for a creative writer to write a Blog/ Content that describes us and our brand. Called Serenity-Fashion. This will help build 'Our Story'. We have written out some bullet points to help you with the content. We would like this piece of writing to be Cleaver, witty but meaningful. What is our story ?? 6, The world of social media brought our eyes to a different attitude towards fashions that caters for a woman of shape. 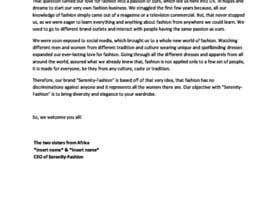 7, We were exposed to seeing women across the world from all backgrounds displaying fashion styles that we loved. 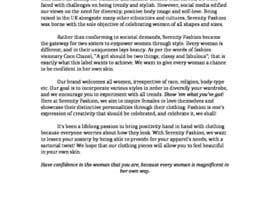 8, Whether you have got lumps and bumps, curves or you are straight, had a baby, or put on a few pounds, lost some weight, or you are naturally slim or plus size, you name it, serenity-fashion is for all women. We want to celebrate this in the UK. 12, This is not a black brand. 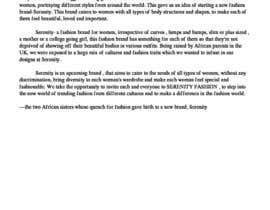 We want to welcome everybody to Serenity Fashion. Dear Contest Holder, Please provide feedback for entry #1 . Thank you!